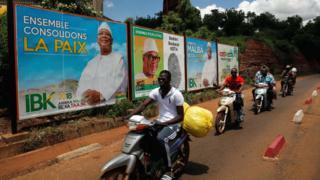 Malians head for the polls to vote for a president on 29 July as the country grapples with chronic insecurity. It is largely fuelled by the ascendancy of jihadist groups in Africa's Sahel region, but the spectre of ethnic clashes and the lingering problem of Tuareg militias have also contributed to the atmosphere of insecurity. An al-Qaeda-linked jihadist group has already issued a video warning people against voting. The group, Jamaat Nusrat al-Islam wal-Muslimin (JNIM), is now the main jihadist group in the country and it has been terrorising villagers in the expansive north - including the cities of Timbuktu, Gao and Kidal. Islamic State (IS) militants are also on the prowl. The jihadists exploit the weak borders of the Sahel and are involved in kidnapping and human trafficking, as well as weapons and drugs smuggling, which finance jihadist expansion. Their activity hampered preparations for the poll and at least one village in Gao reported an attack that coincided with the distribution of voter cards. Twelve people were killed in the attack. What's being done about security? Incumbent President Ibrahim Boubacar Keita is seeking a second and final five-year term. He has seen his popularity wane over the security issue which has had an impact on the country's economy. His critics argue that he has been unable to restore security despite the presence of multinational forces in the country. There are 4,000 French troops who've been battling jihadists in the north and centre of Mali since August 2014. Mali also hosts the headquarters of a joint force, known as the G5, comprising 5,000 soldiers from Mali, Chad, Niger, Burkina Faso and Mauritania. The government has now deployed 30,000 security officers for this year's poll. The president also unveiled four Super Tucano light attack planes to be used during the election period. When the the last election was held in August 2013, President Keita won more than 77% of the vote in a run-off. Mali had just emerged from a coup that toppled his predecessor Amadou Toumani Toure in 2012. The turbulence that followed spurred Tuareg separatists to capture most of northern Mali. The separatists were subsequently overpowered by Islamist militants. This precipitated unprecedented instability from which Mali has not yet recovered. Dozens have been killed in attacks on Malian and international forces. Jihadists have also attacked the headquarters of G5 Sahel Joint Force in Sevare, central Mali. Mali's regional allies and the international community are eager for a peaceful and credible exercise, which would boost efforts to stabilise the Sahel country that is also a key source of illegal African migration to Europe. That too has posed a major headache for the government. Hundreds have been killed in ethnic clashes pitting Fulani herders against Dogon hunters since March. The Dogon accuse Fulanis of ties to jihadist groups. The latter allege that the military has armed the hunters to attack them. In June, the army admitted that soldiers were involved in "serious violations" after numerous discoveries of suspected Fulani mass graves in the central region of Mopti. On 11 June, voters' cards were burnt during a protest against poll preparations in Kenieba, western Kayes region. Local media say that there is little campaigning in the volatile north and central regions where militants have threatened to attack those participating in such activities. Who are the other candidates? There are 23 other presidential candidates. The president's main challengers include Soumaila Cisse who faced him in a run-off in the last election. The other key challengers include former Prime Minister Modibo Sidibe, Dramane Dembele and Brig-Gen (rtd) Moussa Sinko Coulibaly. There is also one woman candidate - Djeneba N'Diaye. A candidate must get more than 50% of the vote to win. If not, a run-off is held between the two candidates with the most votes. The winner of the run-off only needs a simple majority. The president's declining popularity and the crowded race suggest that this election may culminate in a run-off.